Felt and wool. Maybe other textiles of the traditional uniforms. In any case, steel was not in the standard equipment. As the Italian soldiers in 1915 reached the front line, they wore almost exclusively simple cloth cap. And this was not only the case of Italian troops. Soldiers of most nations went into battle in the same traditional hats. The only exception, German soldiers wearing the Pickelhaube helmet. It took only few months and a huge number of victims of head wounds to note that a successful war required not only “clever heads” to devise new strategic solutions, but also “protected heads” to survive the front, where Shrapnel and later high-explosive caused about 80% of the injuries among troops in the open. That's how Adrian was conceived: the first modern steel helmet was designed for the French Army in summer 1915 and named by his inventor: August-Louis Adrian. Weighting only 765gr, much less than the almost contemporary British Brodie helmet – delivered to the troops starting from 1916 – and the German Stahlhelm – adopted between end 1915 and beginning 1916 –, it was so effective against the shrapnel, that many other armies adopted it by the end of the World War I. Each model was then modified and improved during the WWI. 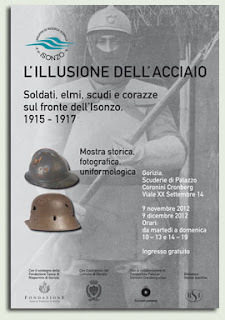 The new exhibition in Gorizia,“L’illusione dell’acciaio - Soldati, elmi, scudi e corazze sul fronte dell’Isonzo 1915 - 1917”, reviews this history of the helmets, and generally of the steel protection, during the First World War. It is directed anyway not only to experts and enthusiasts of military history. This exhibition deals in fact first of all with soldiers, it tells their story concealed under cloth caps and under helmets, and disclose maybe the illusion of the steel, protecting the heads from the bullets, not really from other war traumas. We wonder if the curators had this in mind, as they gave this title to the exhibition. To confirm this supposition, we just have to visit it. The exhibition takes place at Scuderie of Palazzo Coronini Cronberg from the 9th October till the 9th December 2012. Further information here.